And 1199 members ask the hospital giant: This contract is #Better4Who? In its slick advertising campaign, NYU Langone Medical Center promises the institution is #MadeForNY. 1199ers want to know exactly which New York because it sure isn’t one for working people. For decades, NYU negotiated collective bargaining agreements as part of the League of Voluntary Hospitals and Nursing Homes, an employer association of New York’s largest, private non-profit healthcare institutions. (1199’s contract with The League covers some 40,000 workers and is the Union’s gold standard in terms of wages, health care, pension and other benefits.) But in March 2016, mid-contract, NYU withdrew from the League and moved to bargain independently with 1199SEIU. The 1199SEIU Benefit Fund, in turn, issued notice that the megasystem would have to begin paying non-League rates for workers’ benefit and pension coverage. 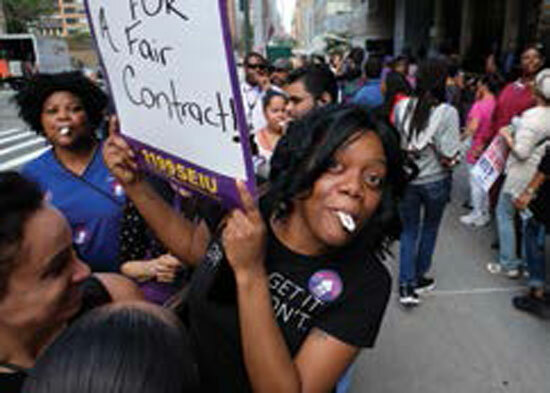 A struggle ensued, with NYU claiming its effort was to “negotiate directly on behalf of our workers and patients.” The National Labor Relations Board disagreed and issued a complaint alleging the hospital’s mid-term contract withdrawal violated the National Labor Relations Act. NYU refused to back down and threatened to balance their books on workers’ backs; unless they got a better rate, said hospital officials, they’d make up cost differentials in reductions to raises and health benefits. NYU workers, infuriated by the hospital’s clear, long-term strategy of breaking the union and benefit rollbacks, have been voicing their anger at community gatherings, walk-ins and this summer’s League contract negotiations. Most recently, thousands of NYU workers and their supporters turned out on Sept. 27 for a raucous, multi-site informational picket. Despite a fraying relationship, contract negotiations between NYU and 1199 commenced in August. The institution immediately made known its intention of pursuing special treatment and even brought the issue before the hospital’s board of trustees, which rejected management’s pitch for reduced benefit payments. Union negotiating committee members expressed frustration with the institution’s unwillingness to seriously approach proposals for the system’s pro-techs and RNs and NYU’s hardball tactics around core issues like benefits and wages. Reina Cintron, a certified surgical technologist with 23 years at the hospital, was infuriated by the hospital’s refusal to acknowledge workers’ contribution to the institution. At press time, negotiations were ongoing. Workers were holding the line.